PDEQ offers free environmentally-related presentations, information and tips for a variety of audiences including schools and youth groups, community groups, businesses, associations, agencies, and industries. We co-sponsor and attend community events and provide environmental information using hands-on exhibits to engage a wide variety of participants. PDEQ also operates the state-mandated Clean Air Program to improve air quality by increasing public awareness and encouraging community action to reduce air pollution. 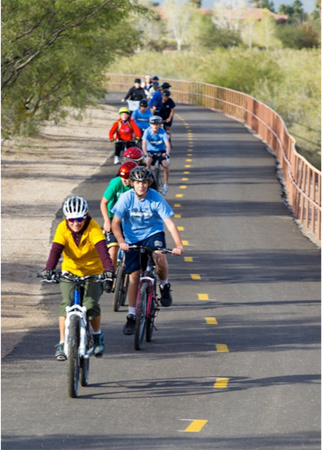 In addition, PDEQ initiates special programs or campaigns to highlight specific actions that can be taken to reduce vehicle emissions and improve air quality, such as the "Use The Loop for Your Commute" and the "Healthy Air Is In Our Hands" campaigns including a "Drive-Less Pledge for Healthy Air". In addition, there is the "Pump Up Your MPG" Tire Inflation Education Program which promotes monthly tire checks for improved air quality and reduced waste. PDEQ works with local organizations to expand the reach of our programs and recently partnered with the Tucson Audubon Society and others to create the "Desert Dwellers Know" poster and coloring/activity book. The dramatic use of Byrd Baylor's poetry and beautiful images provides inspiration for ways to live gently in the Sonoran Desert. The goal of PDEQ's Environmental Justice Program is equal and fair treatment of all residents and meaningful involvement of all regardless of race, color, national origin, or income with respect to environmental programs, laws and policies. If you are looking for information from our department such as records on a specific property or records regarding the day-to-day operations of our Air, Water, Waste Programs, those can be obtained by making a public records request. Other types of general information requests regarding the environment and/or copies of forms, procedures, pamphlets, or other printed information designed for public distribution can be obtained by calling (520) 724-7446. Businesses and industry associations can request presentations to learn or refresh knowledge about airborne dust and stormwater regulations. Businesses planning benefits or transportation fairs can invite PDEQ staff as an exhibitor or speaker to share information about air quality and alternative modes of transportation. Free presentations and information regarding air quality, climate change, stormwater, pollution prevention, and general eco issues are a great fit with Science Day, Earth Day, Love of Reading Week, Career Day and regular science and health classes. Check out our webpages to have fun and learn more about air quality, water, climate change, soil, reduce, reuse and recycling. Free presentations are available at neighborhood association and community group meetings regarding air quality, stormwater, pollution prevention and general eco issues. Visit our booth at various community events to discuss environmental concerns or learn more ways to be eco-friendly. Environmental Justice is defined by the U.S. Environmental Protection Agency as the fair treatment and meaningful involvement of all people regardless of race, color, national origin, or income with respect to the development, implementation, and enforcement of environmental laws, regulations, and policies. Pima County Department of Environmental Quality (PDEQ) is committed to this same goal for all communities within Pima County. Environmental Justice will be achieved when everyone enjoys the same degree of protection from environmental and health hazards, and has equal access to the decision-making process to have a healthy environment in which to live, learn, and work. 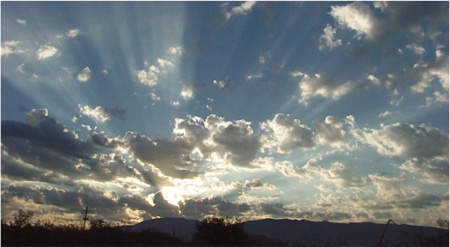 An Environmental Justice Study was performed by Ms. Barbara Tellman as part of the Sonoran Desert Conservation Plan. This study examines the impacts to minority and low income individuals in Pima County of past governmental decision making in the areas of air quality, transportation, water quality, water supply, land use, housing, fiscal decision making, and matters of cultural sensitivity. Pima County Department of Environmental Quality, PDEQ, has established a grievance procedure to ensure prompt and fair resolution of complaints alleging violations in the administration of PDEQ's programs and activities. At Pima County Department of Environmental Quality, our Environmental Justice Program Coordinator can be reached at (520) 724-7446. Requests for information to PDEQ generally fall into two categories: general information requests and public records requests. A general information request may include information about the environment, copies of forms, procedures, pamphlets, or other printed information designed for public distribution. General information requests and payment for completed requests can be made by calling PDEQ at (520) 724-7400. A public records request includes, but is not limited to, documents and electronic files prepared, owned, used, or retained by PDEQ in the course of conducting its work. Request forms and more information are available through our Public Records Request Frequently Asked Questions under "How can I request a PDEQ public record?" PDEQ maintains records regarding the day-to-day operations for the Environmental Quality Division including the Air, Water and Waste Programs and will provide records that are maintained in the format preferred by the requester. PDEQ records may be paper files, database information, PDF files, Word documents, Excel spreadsheets, engineering plans, microfiche or other format. PDEQ is not required to create a record that is not maintained in the normal course of doing business (i.e. manipulate data to meet a specific public record request) nor is it required to obtain new data, perform research or create new report formats. PDEQ is a predominantly paperless department that utilizes multiple internal databases to house records. PDEQ files and databases provide the most historically accurate and extensive property search results when using a street address. PDEQ is able to provide property records utilizing a parcel number or township/range/section criteria, however, the record information provided will be limited to the particular search criteria provided. Under Arizona State law, the public can request in writing to examine or copy public records. Arizona's public records law should not be confused with the federal Freedom of Information Act, which applies to records held by federal agencies. Pima County does not have a central repository for all its records. Each department and division within Pima County houses its own records (A.R.S. Public Records Reproduction - A.R.S. § 39-121). Find answers to most Frequently Asked Questions concerning public records requests. What can I do if I think there is mold in my home or business? Pima County Department of Environmental Quality does not have the authority to investigate or address mold concerns inside residences or businesses in Pima County. It is the property owner’s responsibility to determine if mold is present and if so, to properly remediate it. There are many mold remediation businesses you can hire to determine if mold is present in your home and to clean up the mold, if you are unable to do it yourself. In addition, the U.S. Environmental Protection Agency has information and resources on their website that might be helpful, including ways to prevent and control mold, guidelines for cleaning up mold, and general information on mold and other indoor air quality topics. What agency does the air quality monitoring in this region? How do I know what the current air quality is? Visit Air Quality Information or call (520) 724-7400 during regular business hours. How can I be notified when the air quality is unhealthy? Where can I get information about air pollution and Tucson’s air quality? Where can I find more information about contrails? The U.S Environmental Protection Agency worked with the National Oceanic and Atmospheric Administration, NASA, and the Federal Aviation Administration to develop an Aircraft Contrails Factsheet and the Arizona Department of Environmental Quality also provides information on the formation of contrails. Where can I find information about public transit? Where can I find information about bike riding? Where can I get information about carpooling or vanpooling? Where can I get information on the car-free, multi-use pathway called The Loop? Who can I talk with about scheduling an environmental presentation for my class or community group / neighborhood association? How can I get help with a report on the environment / air quality for my class? How can I get brochures related to air quality or protecting the environment for my students, business, and neighbors? How do I make a public records request for information from Pima County Department of Environmental Quality? How do I submit a complaint about: buffelgrass, manure, dust, someone burning garbage, my neighbor’s messy yard, or other environmental concerns?